Talk to him to sign up for the quest. He will assign you your first test, which is to go help Geshupenschte in Einbech. How to get to Einbroch: Take the Izlude airship (1200z). Exit at Yuno. Go downstair into the terminal, talk with the Airport Staff to take the airship to Einbroch. Exit the airship as it arrive at Einbroch. Requirements: You must be a Merchant at job level 40 or higher in order to start the quest. In this part of the test, he will ask you to collect a set of items. Just bring him the items he asked to pass the test. There are five sets of possible items, all listed above. In each set, there is one piece of weapon. You have to get that weapon from the store, giving him the same weapon but with an extra slot will not work. 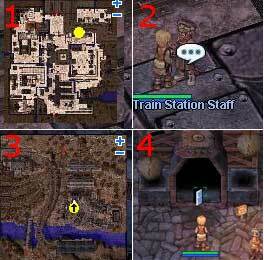 See below steps for locations of each. For each delivery, you will get a receipt from the NPC. Show the receipt to Geshupenschte to pass this part of the test. After that, he will direct you to go back to Guildsman Altiregen. Guildsman Altiregen will ask you to find Mitmayer for the last test. Note: If for any reason you don't have the receipt with you, you will have to start the whole quest all over again. Give her the item, she will issue you a receipt. Take that receipt back to Geshupenschte. Lower right of Lighthalzen, near to the "chopping down axe" structure building. Give him the item, he will issue you a receipt. Take that receipt back to Geshupenschte. If you pass the test, she will give you a Hammer of Blacksmith as proof of success. You must show it to Guildsman Altiregen in order for him to change you into a Blacksmith. He will also give you 5 steels if your job level is below 50 (job level 50 players get 10 steels). Note: If you loose the Hammer of Blacksmith, you will have to start the quest all over again.